However, Do You Really Need to Store Champagne? Champagne is a fizzy and bubbly type of wine that is usually manufactured in France, in the Champagne region. It is often used for weddings, birthdays, various holidays like New Year, and other happy occasions. Some people keep bottles of this bubby wine readily on hand just because it is an important thing to have in a thorough wine collection or because a special occasion can come up at any time. Regardless of the reason, it is important to learn how to store it so that it tastes great when you pop the cork. If you frequently drink champagne, you need to know the storage of it. Generally, there are several factors that play into the proper storage of champagne. You need to consider the humidity, temperature, light, and vibratory conditions involved in storing wine, as well as the storing position. Let's learn about the details. Ideally, champagne should be stored at around 52-53 degree Fahrenheit. If you are storing wine for long periods of time, keep it at a regular temperature of 48-53 degrees Fahrenheit. Champagne will age best at temperatures that are a little bit colder than wine. If you are storing champagne for less than a year, keep it at a temperature preferably below 60 degrees Fahrenheit but above 48 degrees. It will oxidize and age poorly if you keep it above 65 degrees Fahrenheit, so never store it for long at higher temperatures and keep the temperature as constant as you can. If the temperature shifts erratically, the champagne will not store well. You need to have some humidity in the air to store champagne properly. This is really important if you want to know how to store champagne. The ideal humidity level for the storage of champagne is about 75 percent but you can go as far apart as 50 to 85 percent humidity. This makes sure that the corks do not dry out on your special day. If the humidity level is too high, the label will get moldy and will start to deteriorate or peel. As the season changes, the humidity levels will fluctuate a great deal, so you may need to buy a humidifier to keep and set the proper humidity at all times. When you store champagne, the area should be completely dark. You need to keep it away from artificial light and sunlight. Both things will increase the temperature of the storage area, which will result in premature aging of the product. If you can't maintain a constantly dark environment, put the champagne inside a box to keep it in the dark. Champagne made in clear bottles must especially be stored using special precautions. You can't allow champagne to vibrate as this will negatively impact its storage. 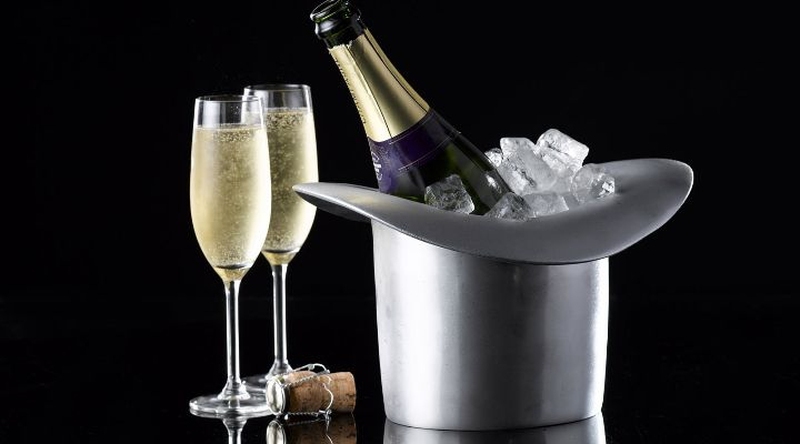 Store the champagne in a place that won't shake it up, such as near an air conditioner or near the washer and dryer. When you are asking yourself how to store champagne bottles, you may wonder whether they should be stored upright or in a horizontal position. Basically, it all depends on how long you intend to keep the bottle of champagne stored. If you are keeping it for a month or less, the bottle should be standing up. If you are planning to store it for a longer period of time, the bottle should be horizontal. You should invest in a metal stopper of high quality that will keep air out of the bottle. Put the bottle in a horizontal position in the refrigerator so that it can keep an even taste and tone. Put it in a place in the fridge where it won't be disturbed. Never just stuff the original cork back in. It won't be able to keep its normal high pressure stopping point and there is a good chance that the air quality will adversely affect the champagne and it won't taste good. Actually, you need to ask yourself if you really want to store it at all. Most champagnes and sparkling wines are intended to be used as soon as they are open. After you get it from the area you are keeping the champagne in and put it in the refrigerator for cooling before serving, you should pour it into your glass for immediate consumption. Champagnes, unlike red or white wine, does not need to be aged and can be used immediately after manufacturing it. Champagnes are, however, able to evolve, change and improve their quality over time, but the most work of the aging process has been done by the manufacturer of it. By law, a blend of wines from different years of harvest, also known as non-vintage wine, needs to be aged for a minimum of fifteen months. For vintage champagne, on the other hand, there should be storage for about three years before it is considered to be palatable. After knowing how to store champagne, you may also want to know how to serve it properly.